Baidu, if you haven't heard of them before, are basically the Google of China, and make no qualms about it, they are huge! There have long been rumours that Baidu would make its own mobile OS, following the same path Google have taken with android. Today Baidu have actually announced this new OS named Baidu Yi, and technically it is still android. Baidu have forked android, which basically means it is built upon android so follows many features that android has. 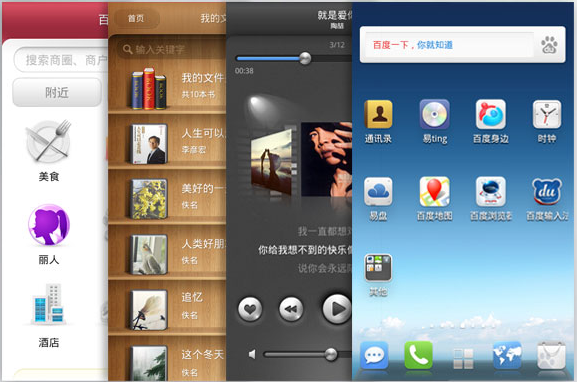 But Baidu have replaced the core Google apps such as its maps and music apps with their own versions. Baidu already have some android apps on the android market too, including a chinese input keyboard app which will presumable form part of this new OS. This is pretty big news, so expect the Chinese mobile market to start heating up very soon!